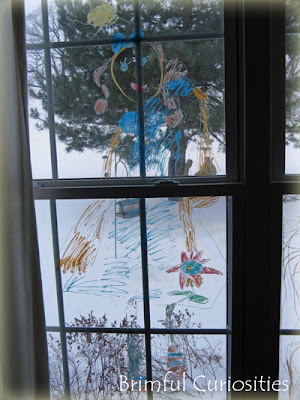 Would you let your kids draw on your windows? My daughter used the large windows in our den as a canvas a month ago and drew a life-size girl with Crayola Washable Window Markers. (I bought our markers from CSNStores but they are currently out-of-stock. Otherwise they are available from other stores including Office Depot, Amazon or directly from Crayola.) Thanks to Little Page Turners for introducing us to this fun product! How fun is that? I don't know that these markers were available when my boys were younger, but I think it's an awesome activity! Your daughter is a pretty good artist too! So cute! I actually almost bought those window crayon things yesterday, but then I was afraid they would think all walls were good surfaces to draw on. What an adorable picture. I think I want to get some washable crayons so my kids can draw on our door wall. What a great idea! WE love our window crayons. I do limit them to the sliding glass doors in our kitchen. I love the life-size girl - cute! great drawing.. I have those markers but have no clue where I put them.. Cool idea! I haven't seen those yet, but I love it!